Guided by two or more adult Coaches, FIRST LEGO League (FLL) teams of up to 10 members, in grades 4-8 , research a real-world problem such as food safety, recycling, energy, etc., and are challenged to develop a solution. They also must design, build, program a robot using LEGO MINDSTORMS®, then compete on a table-top playing field. For more information about programs in your area or to learn how to start a team, please contact one of the program organizers listed here. Visit our Calendar page to find events in your area to enjoy. All FIRST events are free and open to the public. 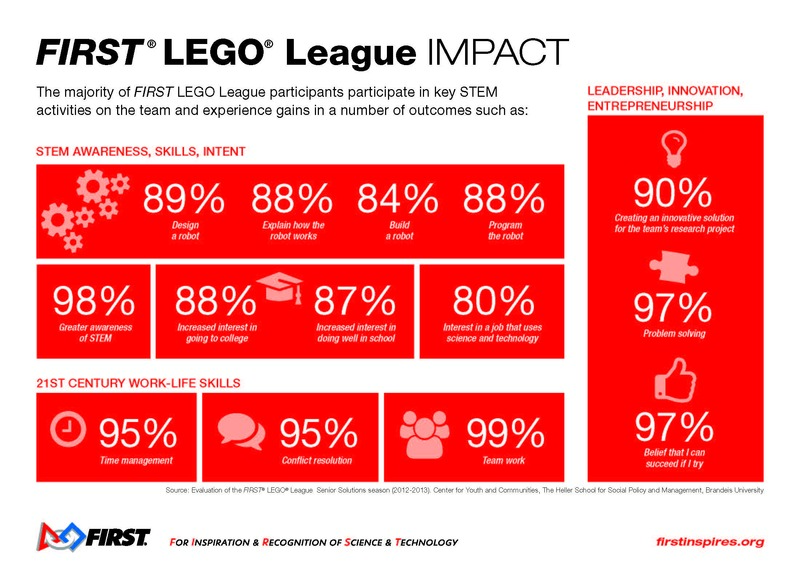 FIRST LEGO League (FLL) Introduces students in elementary through middle school grades to real-world engineering challenges by building LEGO-based robots to complete tasks on a thematic playing surface. FLL teams, guided by their imaginations and adult coaches, discover exciting career possibilities and, through the process, learn to make positive contributions to society. FLL started in Florida in 2001 with 40 teams, and a State tournament in Cocoa Beach. In 2016 there were nearly 800 teams statewide. The state is divided into five regions run by volunteer FIRST LEGO League Partners. From the single state tournament, FLL in Florida now hosts more than 50 qualifying tournaments, and five regional tournaments, from which winners proceed to the FLL State Championship. Qualifying and Regional Tournaments are hosted by FLL teams, FTC or FRC teams. In FIRST LEGO League, students in 3rd through 8th grade build and program fully autonomous robots out of – LEGOs! They also do a research project component and related presentation. The 2017 season challenge is called Hydro Dynamics the FIRST LEGO League game page for full game details!